JOHN IRELAND (1879-1962): Piano Music, Vol. 3 - First Rhapsody (World Premiere Recording), Rhapsody, 2 Pieces, 4 Preludes, 2 Pieces, Ballad of London Nights, The Almond Trees, 3 Dances, Prelude in E Flat. 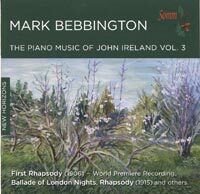 Description: Yes, there's a lot of Ireland piano music out there but, as with volume two of this series, we offer this for the First Recording of the 1906 Rhapsody, a rugged and assertive piece which seems to seek to synthesize Liszt and Rachmaninov but which also already shows some elements of the more subtle style which would mark much of his mature work. Mark Bebbington (piano).